My name is Krzysztof Tyszecki and I’m third year CS student at Wroclaw University of Technology (faculty of Fundamental Problems of Technology). I’m using GNU/Linux since about 5 years (Gentoo Linux for about ~4 years, now Debian and Arch). If after a few months you will simply forget about manually editing configuration files after upgrades, that will mean that this project had succeeded. Dominique nicely described some technical details in post at his blog. # Kismet is using them. This requires DBus support! The model is far from being complete, but from now, code for other variables can be easily added. Some variables should be also labeled as mandatory. Besides that, I didn’t found a way to check the correctness of the value other than regular expression yet. While regexps are powerful and it’s entirely possible to define constraints using only regexps – sometimes they’re just not the best choice. Ability to define a function that would perform the check would be great. 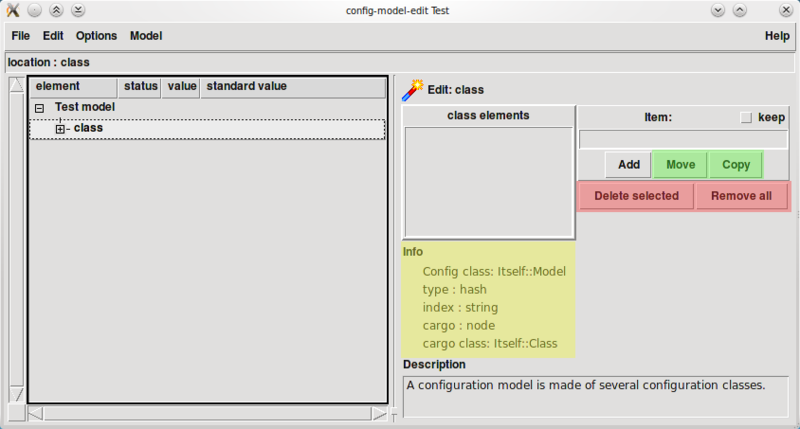 Dominique asked me for some feedback on config-model-edit, since I had a hard time using it. After loading a model created by hand, it’s easy to edit it using aforementioned tool, but creating one from scratch may be a hard task, especially if somebody is using config-model-edit for the first time. „Move” and „Copy” (green overlay) buttons are related more to the list box than to the edit field. These buttons could be in a context menu for the list item. If „Move” would be placed in the context menu, instead of renaming highlighted item to the contents of the edit field, it could turn on in-line editing for the list item (I’m not sure if Tk allows this). In my humble opinion, „Rename” is a more suitable name for „Move” button. „Copy” could make a copy of selected item, naming it „Copy #n of _item_” and turn on in-line editing on the newly added item. „Delete selected” and „Remove All” (red) could be placed below the list box or in the context menu. „Are you sure you want to delete all of the items” confirmation box after clicking „Remove All” would be nice. In this case, „Info” box (yellow) takes a lot of space, and it’s contents are not essential. The „keep” checkbox could be a part of the context menu for the edit field. If Tk is limiting the GUI then maybe it would be a good idea to create GTK2 based one, since there are Perl bindings available? Thanks a bunch for taking the time to comment on the GUI. These are fair comments for real issues that need to be fixed. Before writing the GUI, I indeed thought about using a more modern toolkit than Tk, but, unfortunately, I lacked the time to learn other toolkits. I think that most of the issues mentioned can be fixed with Tk. 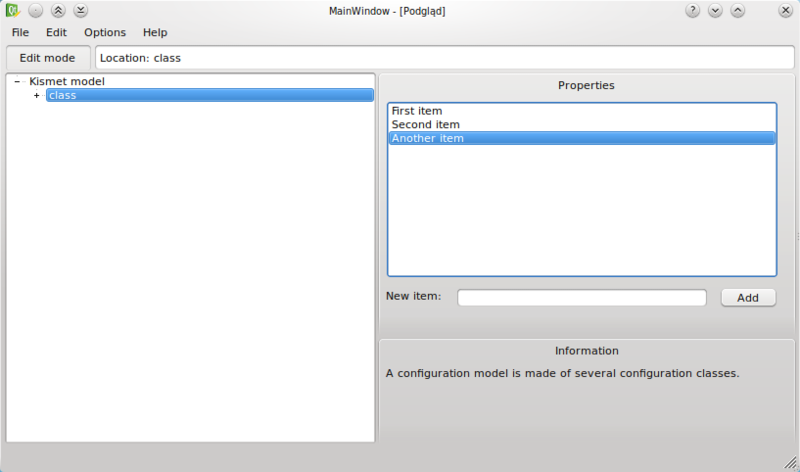 Nervertheless, a GTK or Qt or Wx GUI is indeed a nice idea. 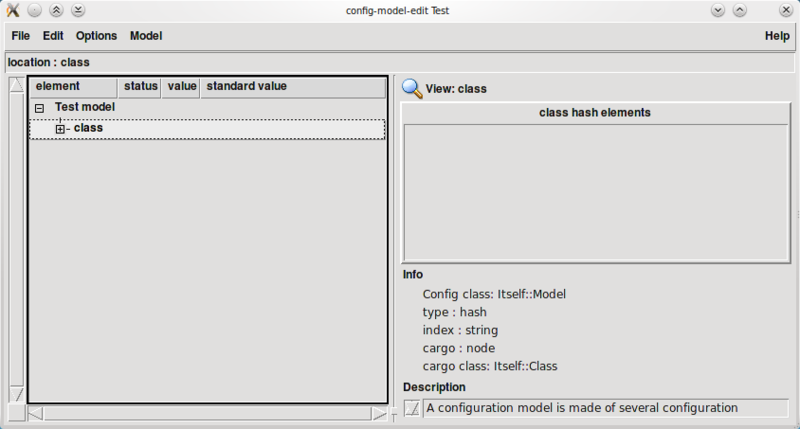 I’ve just release Config::Model::TkUI 1.307 that fixes most usability issues found by Krzysztof. Unfortunately, Perl/Tk does not provide Listbox with in-place editing so I’ve no easy solution beside a separate entry and a „rename” button. I’ve finally found the reason behind the randdom text displayed in the error window. In most of my code, I use Exception::Class to treat errors. So error in eval block will set $@ to an Exception::Class object instead of a plain string. Execption class have overloaded „” so when $@ is used in a string, it should do the right thing and call as_string method on the exception. I passed $@ to the -text option of Tk::Dialog. Most Tk is actually C code wrapped in XS. I guess that the stringification did not occur before the exception object was handled deep in the C code. 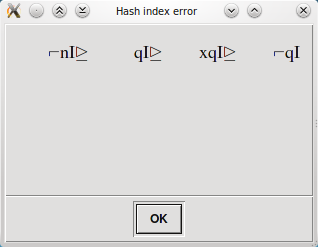 So I guess that Tk::Dialog tries to display the inner C structure of the hash ref hidden behind the exception. Anyway, the fix is quite simple: explicitely use the as_string method with Tk::Dialog. Hmm, I forgot to mention that these fixes will be released in Config::Model::TkUI 1.314.